All stones are genuine and natural! T he morganite stone shows off a soft pink glow, very sparkly and lovely. My pictures really didn't do just to the beautiful ring! The diamonds are near colorless and I1-I2 clarity, very sparkly. ★Center Stone：100% Genuine Morganite. Shape：Round. Shape：Round Single Cut. Ring Size：6.5 (resizable). Width Bottom：1.2mm. Width Top：11.7mm. Service you wholeheartedly. You will get response within 24 hours. ALL THE INFO ON THIS ITEM DOWN BELOW. Color Stones: 100% NATURAL MORGANITE. Shape: PEAR BRILLIANT CUT. Stamped: 14K. Ring Size: 5.5 (RESIZEBLE). Total Gram Weight: 3.6GR. (★Center Stone：100% Genuine Lightest Pink Morganite. Shape：Cushion. Stamped：925. Shape：Round Single Cut. Ring Size：6.5 (resizable). My jeweler has over 10 years of experience in handling gem stones. 2) Ring Redesign. ★Center Stone：100% Genuine Lightest Pink Morganite. Width Top：7mm. ★Side Stones：100% Genuine Natural Diamonds. Shape：Round. Shape：Round Single Cut. Ring Size：6.5 (resizable). Width Bottom：1.6mm. You will get response within 24 hours. ★Center Stone：100% Genuine Morganite. Ring Size：6.5 (resizable). Color：Pink. Shape：Round Single Cut. Width Top：11mm. The cost of each country is different. Custom make your own ring or redesign the ring. Total diamond weight: 0.55 Ct. HIGH QUALITY US MADE RING! Top size : 13.5×11.5 MM. ★Center Stone：100% Genuine Morganite. Ring Size：6.5. Width Bottom：1.2mm. Width Top：9.8mm. You will get response within 24 hours. we are very glad to help you. Service you wholeheartedly. Clarity：Flawless. Size：7x5mm. ★Center Stone：100% Genuine Lightest Pink Morganite. Shape：Oval. Shape：Round Single Cut. Ring Size：6.5 (resizable). Width Top：8.3mm. You will get response within 24 hours. we are very glad to help you. ★Center Stone：100% Genuine Lightest Pink Morganite. Shape：Oval. ★Side Stones：100% Genuine Natural Diamonds. Shape：Round Single Cut. Ring Size：6.5 (resizable). Total Gram Weight：2.6g. Width Top：12.6mm. ★Center Stone：100% Genuine Morganite. Shape：Cushion. Custom make gold & diamond jewelery per your designs and specifications. Ring Size：6.5 (resizable). Color：Pink. Width Top：8.2mm. Service you sincerely. ★Center Stone：100% Genuine Lightest Pink Morganite Morganite. Setting：Channel，Prong Setting. Shape：Round Single Cut & Baguette Cut. Shape：Round. Ring Size：6.5 (resizable). Width Bottom：1.7mm. Width Top：7mm. (★Center Stone：100% Genuine Lightest Pink Morganite. Setting：Pave & Prong Setting. ★Side Stones：100% Genuine Natural Diamonds. My jeweler has over 10 years of experience in handling gem stones. 4) Upgraded Diamonds (full cut, VS/VVS clarity or other). » If you have a particular design in mind, we can manufacture customised products as well. If you like to make any changes to be made on a particular product of ours for ex. We advise removing this ring when being exposed to any type of substance or chemical. 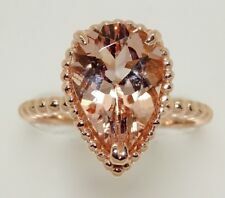 10k.- 1.31 Carat Peach Morganite Diamond Genuine Engagement Ring Rose Gold 6.5. This is a gorgeous Round 1.25 Carat Peach Morganite center stone it has a antique design in both sides that have diamonds (Color H, Clarity SI2 ). The diamonds on the both sides equal 0.06. Size：8X6mm. ★Center Stone：100% Genuine Lightest Pink Morganite. Shape：Oval. ★Side Stones：100% Genuine Natural Diamonds. Shape：Round Single Cut. Ring Size：6.5 (resizable). Width Bottom：1.3mm. Total Gram Weight：2g. Their cut is so accurate a star is visible through the top of the crown with a diamond scope. Color Stones Change (White Topaz, Blue Sapphire, etc). They are bright and sparkly and display more fire than the best grade of diamonds as shown in the table below. ★Center Stone：100% Genuine Lightest Pink Morganite. Setting：Pave,Bezel Setting. Ring Size：6.5 (resizable). ★Side Stones：100% Genuine Natural Diamonds. Total Gram Weight：3.6g. Width Top：10.1mm. Carat Weight：1.5ct. Center Stone: Natural Morganite. Generous Diamond & Gemstone Jewelry. Shape： Oval Cut. Side Stones： 100% Genuine Natural Diamond. Ring Size：6.5US. Width Top： 12.3mm. Service you wholeheartedly. You will get response within 24 hours. Size：7x5mm. ★Center Stone：100% Genuine Lightest Pink Morganite. Shape：Oval. ★Side Stones：100% Genuine Natural Diamonds. Ring Size：6.5 (resizable). Width Top：22.5mm. Service you wholeheartedly. You will get response within 24 hours. Size：7x5mm. ★Center Stone：100% Genuine Lightest Pink Morganite. Shape：Oval. Ring Size：6.5 (resizable). Width Top:12.2mm. You will get response within 24 hours. we are very glad to help you. Service you wholeheartedly. Gem Type: Morganite. Diamond Wedding Band. Cut: Round & Brilliant Cut. Diamond Information. Color: Pink. Center Stone Information. Gold Weight: Approx. We accept Custom-Design, Tailor-made for your gemstones. ★Center Stone：100% Genuine Lightest Pink Morganite. Setting：Prong Setting. Shape：Round. Shape：Round Single Cut. Ring Size：6.5 (resizable). ★Side Stones：100% Genuine Natural Diamonds. Width Bottom：1.6mm. Size：6X4mm. ★Center Stone：100% Genuine Lightest Pink Morganite. Shape：Oval. ★Side Stones：100% Genuine Natural Diamonds. Ring Size：6.5 (resizable). Width Top:7.9mm. Service you wholeheartedly. You will get response within 24 hours. (★Center Stone：100% Genuine Morganite. ★Side Stones：100% Genuine Natural Diamonds. Shape：Round Single Cut. Shape：Round. 4) Upgraded Diamonds (full cut, VS/VVS clarity or other). Ring Size：6.5 (resizable). ★Center Stone：100% Genuine Lightest Pink Morganite. Shape：Oval. ★Side Stones：100% Genuine Natural Diamonds. Ring Size：6.5 (resizable). Total Gram Weight：2.1g. Width Top：10mm. Carat Weight：0.8ct. Total Carat Weight：0.04ct. Size：7x5mm. ★Center Stone：100% Genuine Lightest Pink Morganite. Setting：Pave,Prong. Shape：Oval. Ring Size：6.5 (resizable). ★Side Stones：100% Genuine Natural Diamonds. Total Gram Weight：2.2g. Width Top：9.1mm. Size：5x5mm. ★Center Stone：100% Genuine Lightest Pink Morganite. Shape：Trillion. Setting：Pave,Prong Setting. ★Side Stones：100% Genuine Natural Diamonds. Ring Size：6.5 (resizable). Shape：Round Single Cut. ★Center Stone：100% Genuine Lightest Pink Morganite. Setting：Pave & Prong Setting. Shape：Round Single Cut. Shape：Round. Ring Size：6.5 (resizable). My jeweler has over 10 years of experience in handling gem stones. ★Center Stone：100% Genuine Lightest Pink Morganite. ★Side Stones：100% Genuine Natural Diamonds. Shape：Round. Shape：Round Single Cut. Ring Size：6.5 (resizable). Width Bottom：2.6mm. Width Top：8.8mm. You will get response within 24 hours. ★Center Stone：100% Genuine Morganite. Color：Pink. Ring Size：6.5 (resizable). Width Top：8.5mm. Clarity：Flawless. 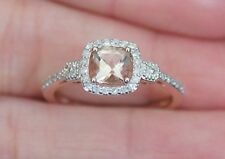 18k White Solid Gold Light Pink Princess Cut Morganite with surrounding Natural Diamonds in size 4. Light Pink Princess cut Morganite is 2.10 ct.
★Center Stone：100% Genuine Lightest Pink Morganite. ★Side Stones：100% Genuine Natural Diamonds. ★Main Stones：100% Genuine Natural Diamonds. Match Band. Shape：Round Single Cut. Shape：Round. Ring Size：6.5.